We foster inquiry, learning, and creative thought by engaging audiences in programs, exhibitions, and research inspired by our collections. The Rosenbach was founded in 1954 by Dr. A.S.W. Rosenbach (1876-1952) and his brother, Philip (1863-1953). Renowned dealers in books, manuscripts, and ﬁne art, the brothers played a central role in the development of private libraries that later became our nation’s most important public collections of rare books, such as the Folger and Huntington Libraries. The brothers’ own personal collection, now the core of the Rosenbach, features treasures the brothers were unable to part with, including the only surviving copy of Benjamin Franklin’s ﬁrst Poor Richard Almanac and the manuscript of James Joyce’s Ulysses. Our collection is continuously growing, including the addition of the papers of poet Marianne Moore, and Bram Stoker’s notes for Dracula. 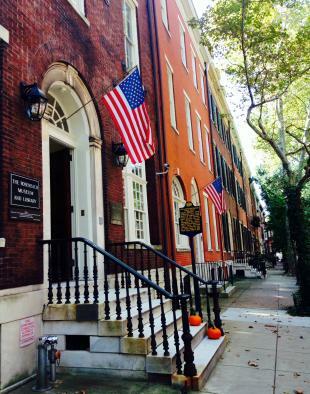 The Rosenbach brothers’ 1865 townhouse at 2010 Delancey Place is listed on the National Register of Historic Places and features an ofﬁcial marker placed by the Pennsylvania Historical and Museum Commission in recognition of the enduring legacy of the Rosenbach brothers. Since 2003, the adjacent Maurice Sendak Building offers spaces for public programs and exhibitions. In December, 2013 the Rosenbach became afﬁliated with the Free Library of Philadelphia Foundation, bringing together two of the world’s preeminent collections of rare books, manuscripts, Americana and art. For a detailed look at our operations and highlights of previous years, download our annual report below.